Previously, I explained how some dishes that are not tofu are called -tofu, because of the shape, texture or both. 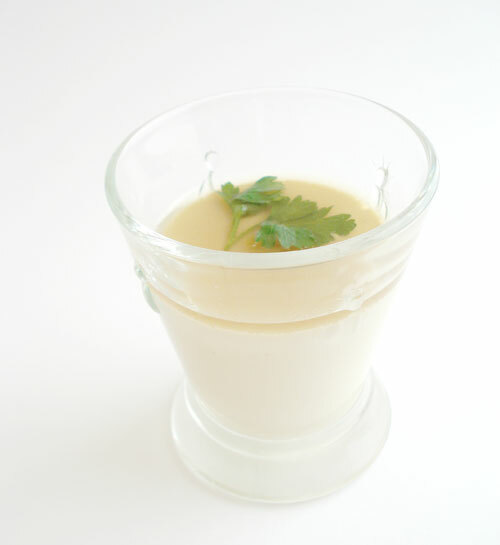 This is the case with tamago dofu　(卵豆腐), a smooth savory egg custard that's served cold. Boil some water in a kettle while you assemble the tamago dofu. (I use an electric kettle.) You'll need enough boiling water to come up at least halfway up the cups or molds you'll be using when placed in the large pan. Mix the soy sauce and salt into the stock. Taste and add a little more salt if needed (remember when it's cool the flavors will dissipate a bit). Beat the eggs with a fork or chopsticks, trying not to make it too foamy. Add 330 ml / 1 1/2 cups of the soup stock to the eggs, and mix thoroughly. Strain the egg mixture through a fine meshed sieve. This smooths out the texture by getting rid of the bubbles and any bits of unincorporated egg white. You can skip this step if you can't be bothered - it won't affect the flavor, though the texture may not be as velvety smooth. Pour the mixture slowly (so you don't make any bubbles) into the 4 containers. Cover each with plastic wrap, then punch a few holes in the plastic with a skewer or knife tip. (The plastic prevents water drops from falling into the egg custard, and the holes allow excess steam to escape). Put the containers into the large pan. Very carefully (don't splash the water into the custard) pour boiling water into the pan so that the water comes at least halfway up the sides of the containers. Cover the pot with the tight fitting lid. Leave it there for 15 minutes. At the end, the custard should be fairly firm and the color will have turned pale. It will still be wobbly. Very carefully remove the cups from the pot, take off the plastic film covers and slowly pour the rest of the stock evenly over the top of the custard. This prevents the surface from forming a film. Leave to cool to room temperature, then re-cover each cup with fresh plastic film and cool in the refrigerator until ice cold. You can make this up to a day in advance. Serve with a little grated ginger and a parsley leaf garnish on top. Normally tamago dofu is cooked in a steamer, or steam-cooled in a simmering water bath. Some people also make it in the microwave. For me, using any of these methods makes custard all bubbly and spongy instead of smooth. By leaving it in boiling water as specified the custard cooks all the way through but remains silky smooth. However, this method only works if you're making individual portions as I am here - if you make a large square of tamago dofu, you will need to add heat. If you serve this hot with some added ingredients like shrimp, ginko nut, etc. 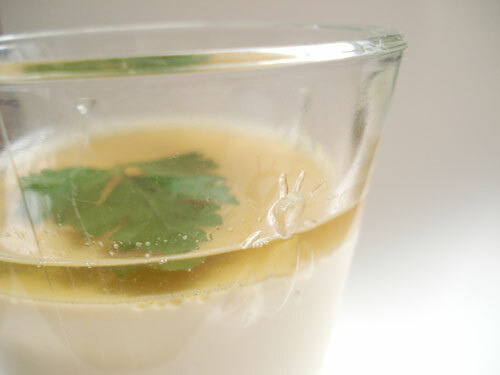 in it and serve it piping hot, it becomes chawanmushi, a classic winter dish. Submitted by maki on 2010-07-01 17:17. This looks lovely and cool as well. Perfect timing! The temps and humidity are such that the less cooking that happens, the better,and even chewing seems like a lot of effort. I will be trying this out later today. I'm guessing that, if the the custard is not sufficiently set after 15 min, one could add more boiling water to the large pot? I also had trouble getting it to set the first time I tried to make it, but I think it was because I didn't beat the eggs enough. Also, I found that putting the pan over low heat helped the water maintain its boil, and it solidified nicely the second time. Thanks a lot for this recipe! I love tamago dofu, both the hot and the cold version, and have always been wondering if there is an easy way to make it at home. I'll definitely try this out soon - I think I'll use dashi though as I really like the taste, also when cold. Such an elegant dish. I can just imagine the silky smoothness of it. You are good . I love this site! 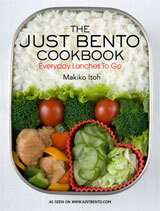 :) It unravels the secrets of Japanese cooking in easy to follow steps! Could you please post a recipe on how to make that delicious Annin Dofu ?? Am dying to make some at home ! Thanks very much for your recipe! I like tamago dofu too, both the hot and the cold version.Thank you for giving us the recipe of an easy way to make it at home. I really like its taste, also when cold.You know tofu is really delicious! Moreover it looks lovely and cool as well. I am also searching for a good ANNIN TOFU recipe. I have eaten an amazing ANNIN TOFU - thick, strong flavoured but with velvet texture, served whole in a cup - in a Japanese Izakaya. This is unlike the normal Chinese style which is less intense in flavour and texture. I am dying to replicate it at home. Please help! Thank you. I am sad, I have just tried this recipe and even if the whole custard tasted delicious it didn't set at all after 20 minutes in boiling water. Now it is been steamed over bain marie, but I tried to avoid since I like the silky texture too, but I like to eat it warm. FYI I used put the custard in 3 small glass jars and used two large eggs for 150ml of stock plus 1/2 tsp salt and 1 tbsp of less salted shoyu. It looked pretty darker than I am used to eat but I didn't have light soy sauce at home. So difficult to find around here. Well, I will try again, just wanted to let you know. Try beating the eggs more. Mine didn't set the first time, either, so I beat the eggs for a good 5-10 minutes with a whisk before adding the stock and pouring into the cups. Eggs are a little tricky, but the secret usually lies in beating them just the right amount. Thanks for re-posting this recipe, I'm going to hunt down the ingredients and make this tonight! Yum! Maki. Are you allright? Lots of flowers and thought for you. I love the pictures here in your post. I hope you wont mind sharing this too to Foodista readers by adding a foodista widget to the end of this post, so it will appear in the Foodista pages. So sorry to know of your ill health. Sending best wishes for a speedy recovery. Is this chawan mushi or is it a different dish? No it's not chawam mushi. If it were, I would have called it that right?